Ukraine's media regulator has ordered all cable providers to stop transmitting top Russian state-controlled TV channels, which have portrayed it as a country overrun by "neo-Nazis" and on the brink of chaos and collapse. The Ukrainian National Council for TV and Radio Broadcasting instructed all cable operators on 11 March to stop transmitting a number of Russian channels, including the international versions of the main state-controlled stations Rossiya 1, Channel One and NTV, as well as news channel Rossiya 24. It said it was acting in the interests of "information security". It was also responding to calls from the National Security and Defence Council, which on 6 March said the presence of Russian TV channels in Ukraine's "information space" represented a threat to "national security". Russian TV's attacks on Ukraine have been relentless. As critic Yekaterina Bolotovskaya wrote on Russian website Gazeta.ru, they have been painting an "apocalyptic" picture of the country, embellished by "bellicose language" reminiscent of the height of the Cold War. Writing for the American magazine Politico, journalist Leonid Ragozin said that Russian propaganda usually contained a "grain of truth", but this was then used in the service of a "big lie". For example, he said, it was perfectly true that ultranationalists played a key role in the street clashes that led to the overthrow of ex-President Viktor Yanukovych, but "all this is a far cry from Nazis taking over Kiev, an image now being stamped into the brains of Russian and East Ukrainian audiences 24 hours a day on Kremlin mouthpieces". This message has been supplemented in recent days by a constant stream of reports backing Crimea's unification with Russia, ahead of a disputed referendum on the peninsula's future on 16 March. "We have not stopped regarding Crimea as ours," a Rossiya 1 news presenter declared on 9 March. Russian TV's role in the current crisis has been crucial because it has been widely watched in Ukraine, especially the mainly Russian-speaking east and south of the country. In Crimea, Russian TV channels have now almost completely replaced Ukrainian ones. Ukraine's media news website Telekrytyka has been at the forefront of efforts to confront what it calls the "manipulation of facts" and "overt lies" disseminated by Russian TV. It pointed to a Rossiya 1 report from 1 March, which appeared to show a gun battle outside a government building in Crimea. "An analysis later showed the video was staged," Telekrytyka said. Reports like this were used to justify Russia's stepping up its military presence in Crimea and supporting the separatist movement there. Russian TV has also repeatedly alleged that Ukrainian "extremists" have been harassing and terrorising journalists, though until recently it had provided little actual evidence for this. That is, until pro-Moscow journalist Sergey Rulev told several of Russia's leading TV channels how he had been set upon by a gang of nationalists who had punched and kicked him, and tried to rip out his fingernails. A report on Gazprom-Media's NTVon 6 March even showed YouTube footage of the alleged attack. But, as Ukrainian blogger Pauluskp pointed out, the full video of the incident (which took place on or before 20 February) clearly shows that Rulev was attacked not by nationalists but by ex-President Yanukovych's hired heavies - the so-called titushki. Activists at StopFake, a website set up by Ukrainian journalists to monitor media coverage of the current crisis, have compiled a whole dossier of what they call "distortions and propaganda"
Evidence of Russian military activity in Crimea can also be found on the YouTube channel of Information Resistance, an impromptu news agency set up by Dmytro Tymchuk, head of the Ukrainian Centre for Military-Political Studies. The issue of how to respond to Russian TV's onslaught has been hotly debated in Ukraine in recent weeks. Some MPs and media experts have been calling for a clampdown. But others, such as Telekrytyka's chief editor Nataliya Lihachova, have warned that this could be "senseless and harmful". In a news conference on 4 March, she said that blocking Russian TV channels could have a similar effect to the Ukrainian parliament's annulment of the law on regional languages, which would have, among other things, lowered the status of Russian in Ukraine. The annulment was vetoed by interim President Oleksandr Turchynov after a public outcry. Russian nationalist MP Vladimir Zhirinovsky told a news conference at the State Duma on 12 March that the ban on Russian channels in Ukraine was an act of "dictatorship". Rossiya 1 said he spoke for MPs of all parties. Russia has also reacted angrily to Ukraine stopping some Russian journalists from entering its territory. The Foreign Ministry accused the international community of turning a blind eye to "such manifestations of censorship". Up to half of Ukraine's cable operators have now stopped carrying the main Russian channels, according to the media regulator. The largest operator Volya has said it will follow suit in the next few days. 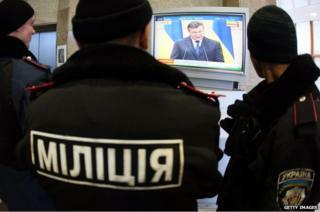 Viewers in Ukraine are also able to access Russian TV via satellite.